Latvia’s second largest city hosts an impressive list of distinguished luminaries in their field who were born in Daugavpils (formerly known as Dvinsk). The list includes the likes of Solomon Mikhoels, a leading figure in the State Moscow Yiddish Theatre and Chairman of the Jewish Anti-Fascist Committee; Oscar Strok, the outstanding musician and composer, known as Riga’s Tango King who in the 1930s became internationally acclaimed for his tangos; Sarah Menkin Foner, the first woman to publish a novel in Hebrew “The Love of the Righteous” (Vilna 1880); and Eliezer Ben-Yehuda, lexicographer and reviver of Hebrew. And arguably the most noted of Daugavpils’ illustrious luminaries was Mark Rothko, who at age ten departed with his family to America, later becoming one of the world’s leading abstract expressionists painters. However, there’s a name which remains unknown and forgotten in Latvia. Nicolai Poliakoff (Nikolajs Polakovs in Latvian), more commonly known by the moniker of Coco the Clown which Polakovs created was also born in Daugavpils. With his trademark distinctive make-up and costume, huge size 58 boots, and a rising wig with hinges in the centre which parted when appearing surprised, Polakovs went on to achieve fame as the United Kingdom’s most renowned clowns of the mid-20th century. Born in Daugavpils in 1900 into a Jewish circus family, Polakovs spent his childhood traveling, having commenced his circus career with a gruelling program of training as a trapeze act. Polakovs’ mind was however set on becoming a clown as he ‘‘liked clowns.’’ Polakovs believed ‘‘you can’t make a clown. A clown has to be born.’’ At a young age as a child the toys he liked to play with was ‘‘only makeup, greasepaint every time,’’ Polakovs memoir states. Eventually in 1919, Polakovs, still in his teens, re-joined his family in Riga and married his wife Valentina in Riga’s Orthodox Church. Having returned to a newly established Republic of Latvia which was proclaimed on 18 November 1918, Polakovs returned to the circus, but this was short-lived, as he again was to serve in yet another army, this time recruited into the Latvian Army. ‘‘People were performing on the streets, and soldiers and officers came to you and asked for your name, address, how old you were, and that’s it - you were in the Latvian army,’’ Polakovs recalled. Polakovs served in the Latvian Army for two years and four months. Later rebuilding his career, Polakovs received engagements to perform in Konigsberg in Germany and then in Berlin, where he was spotted and invited to perform in England in 1929 for a four-week engagement with the Bertram Mills Circus - which developed into a 40 years’ working relationship. By the Second World War, Polakovs’ entire family had relocated from Riga and taken up U.K. residence. They never returned to Riga nor Latvia again. Polakovs was one of the few foreigners who received the Most Excellent Order of the British Empire (OBE), a title awarded to him in 1959 by Queen Elizabeth II for his committed work in raising road safety awareness among children. Polakovs died on 25 September 1974, aged 74, and is buried along with his wife Valentina at the Woodnewton Parish Churchyard in the U.K. 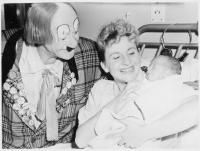 He was inducted as a member of the Clown Hall of Fame in 1994. Polakovs eldest son, Michael who was born in Riga in 1922, followed in his renowned father’s family circus tradition, devoting his life to the circus. Michael Polakovs was known throughout America (to where he immigrated in 1959 after a three-decade career as a circus clown in the U.K.) as the creator of a much-imitated “soap gag” entree, having performed in the center ring at Ringling Brothers. Michael Polakovs was instrumental in designing the post-1960’s Ronald McDonald clown-face features, incorporating into his design the iconic canary-yellow jumpsuit, big red shoes and striped socks to reflect the colours of the fast food restaurant. He acted as McDonald’s emblematic clown Ronald McDonald, and starred as Ronald in their first national series of commercials in 1966. Latvia has a noted clowning legacy and tradition. Ieva Miltina, communication manager of the Riga Circus informed The Baltic Times that traveling circus shows and balagan’s (Russian for marketplace circuses) took place in Latvia from the end of 18th century and since 1888 there where diverse circus programs performed by the Solomonsky Circus, today’s Riga Circus. World-famous clowns like Tom Belling performed in Riga. However, we can only commence to talk about the clowning tradition in Latvia from its development during Latvia’s first independence years of the 1920s. The first Latvian speaking clowns where the theatrical duo Ripsis and Pipsis, and Roland the white-faced clown. They created the musical clown tradition in Latvia and were well known for their sketches inspired by contemporary events which they showed in a satirical manner. ‘‘In Riga, the clowning tradition has not strictly been following the classical canons. But if we look deeper we see that of the time artists were using the roles of the white clown or red and white clown duos,’’ Miltina noted. During Soviet period, the clowning tradition in Latvia became less political (compared to Ripsis and Pipsis’ sketches). The Latvian language also became less frequently used in the circus’s center ring as all artists were part of the international touring system, which allowed some clowns of Latvian origin such as the clown Roland, and Coco the Clown (Nicolai Polakovs) to obtain worldwide fame. ‘‘Regarding the possibility of installing a statue or plaque in honor of Coco the Clown – the final decision will belong to Daugavpils City Council, but the Museum will fully support this remarkable idea,’’ Ivanovs said. ‘‘He was so proud of where he came from and would have been very touched with this idea,’’ said Mina Hassani. In this exclusive The Baltic Times interview, we speak with Mina Hassani, Coco the Clown’s granddaughter who resides in the U.K. Hassani’s mother Tamara, Nicolai Polakovs’ daughter,in 1979 launched Britain’s first circus without animals. What recollections do you have of you grandfather, and what’s one thing you remember about him? Did you ever see Coco the Clown perform? Yes, many times. As a child, my daily task was to polish his trademark size 58 clown boots. I have my grandfather’s size 58 boots and also his walking sticks which were modelled on a ‘belisha beacon’([an orange ball containing a flashing light, mounted on a striped post on the pavement at each end of a pedestrian zebra crossing). How was it having a grandfather who was a world-renowned circus entertainer? He was always our grandfather first and foremost. We knew how famous he was, but he was a very modest man. Who’s keeping your grandfather’s legacy as one of Europe’s great clowns alive? There is no one who carries on in his footsteps, but on the other hand even now in the U.K. when people imagine a ‘clown,’ it is Coco the Clown who comes to mind. This makes me very proud. Your grandfather was born in Daugavpils in Latvia. Did he talk about his parents, his birth city and childhood? I never knew the name of his birthplace and I thank The Baltic Times for bringing that information to my attention. As far as I can remember his father was the stage manager of a theatre in Riga, and before that he was an army cavalry officer. Times were hard, and money was short. Do you feel that the city of his birth, Daugavpils, should erect a memorial to Coco the Clown? Oh, my goodness, he would have been deeply humbled if this came to be and would certainly not expect such an honour. It’s not up to me to tell the people of Daugavpils what they should or should not do, but for my grandfather to be remembered in such a way would be tremendous. Your grandfather’s son, Michael, who was born in Riga, also worked under the name Coco the Clown in America and created the Ronald MacDonald clown. Did you ever meet your uncle? I knew Uncle Michael, his second wife and my cousins who were all in the USA. Yes, he created and was the first Ronald McDonald. He was offered a pension for life for creating him but requested a flat fee instead as he thought the ‘new’ MacDonald’s company would only last a short time. He also created the Ringling Brothers and Barnum and Bailey Circus Clown College which still exists today. How large is the Poliakoff family? It is quite large, I have relations as far afield as the USA, in Israel as well as here in the U.K. Alas, my granddad and my grandmother Valentina, as well as their children - Yelena, Michael, Nadia, Tamara [my mother], Olga and Alexander have also passed away, but there are many cousins left. It was Coco the Clown’s dream to have family members performing in all the great circus’ of the world. Do any family members work in the circus? Well, I have been lucky enough to fulfil his dream by performing in those great circuses as part of my families troupe ‹The Hassani Troupe,› and in my own right as the illusionist ‹Novikova›. I have performed around the world but sadly never in Latvia. I along with my partner own our family circus ‹Circus Hassani› here in the U.K. Your grandfather spent much of his life adult educating children on road safety for which the British Queen awarded him an OBE. He made it a habit of visiting sick children in hospital. He must have loved children? He had a love of people in general. In his view, no one should be unhappy especially children. He had seen too much of that in his own youth, so did his best to make things better. Your grandfather married in Riga at 19 and spent his entire life with your grandmother, Valentina. What were his favourite Latvian food dishes? My grandmother was a superb cook. I remember my grandfather loved borscht, rye bread which was quite difficult to find in the UK back then, and also Latvian Smoked Riga Sprats. I do remember going to a little shop in Kensington in London to buy specialist Baltic and Latvian ingredients. Your grandfather returned to Riga to re-join his family in 1919 and was later conscripted into the Latvian army. Did your grandfather hold Latvian citizenship and a passport? I am pretty sure at that time he still had Latvian citizenship along with a passport. It was much later that he became a naturalised British, as were also the rest of the family. Did your grandparents ever return to Latvia during the Soviet occupation? No, they never went back, as far as I am aware they were worried that they would not be allowed out of the country if they did. It made them sad especially as they got older. Do you have family in Latvia? I’m sure I must have family in Latvia, and it would be nice to find out one day. What would be your one wish for preserving Coco the Clown’s legacy in Latvia? A statue would be wonderful, but a plaque would also be nice, maybe in the theatre in Riga where his father worked, as the theatre is also the first place where Coco the Clown performed in front of an audience. What do you think that Coco the Clown would wish for the city of his birth Daugavpils and Latvia? My grandfather was a gentleman. I›m sure peace and prosperity would be at the top of his list of wishes.